We receive many e-mails and letters from our clients. Below you will find a sampling of the comments and testimonials that we have received. Please feel free to contact me about any product from Executive Accessories. The pen and pencil set looks splendid! Impeccably turned and finished barrels, and the engraving turned out even better than I had hoped. Super nice job! Thanks for your advice on materials selection and engraving and for doing such a swell job. I had a special request for Executive Accessories—to craft a bowling pin to specification, 60 percent of a standard pin's size. As an avid bowler, I wanted a miniature pin to compliment a display of a bowling ball and a retro-style ball bag, which are both 60 percent the size of the original items. With the bag adorned with key-ring memorabilia from tournaments I have entered, the small ball on a pedestal and the pin completing the trio, I have a wonderful display of my favorite sport that also brings me great memories. I know it could not have been easy to take the specifications for a standard bowling pin and scale them down as precisely as you did. The suggestion for the twin rings around the neck of the pin for authenticity completed the task. Thank you, Chris, for taking the time and special care you took in crafting the miniature-bowling pin for me. I love it! Chris, the Big Leaf Maple Potpourri Container is just beautiful. The pewter rose top was a great suggestion. I love it! Thanks so much. Chris, The pen arrived today and my daughter just loves it! Thanks! I got the blotter yesterday. Thank you very much. It has been a long time since I started searching for one. You made this possible. I love the Birdseye maple. Thank you very much. It's with Great Pleasure that I recommend Executive Accessories for products. In my 37 years of business experience I have received many business card holders from numerous companies. However, when I display the holder from Executive Accessories, I'm always asked, "Where did you get that holder?" So, as you can see, I can say without doubt that Executive Accessories has provided me with a card holder of the Highest Quality. Workmanship that is unsurpassed and a great price value to boot. The Figured Maple Multi-Tool turned out very nice. In my line of work, I always need a small screwdriver handy. The Multi-Tool is an attractive option. Thanks for a great tool Chris. 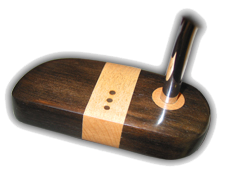 The Cherry Pipe Tamper is a very striking piece. It's one that I'm proud to include in my collection. I wanted to share with you my experience with one of your products. It was close to Mother's day and Mom really wanted a Cross brand pen and pencil set, but time was running out and I didn't have a lot of money. I priced them and was shocked at how high they were! I looked on your site and they were much more reasonable. I picked the custom set you made from real Cherry and delivery was quick. I was worried that Mom was "set" on the name brand, but she really liked the craftsmanship in your hand-made pen & pencil set. She said, "It adds a personal touch that you just can't get with the big names, and to beat it all, standard refills fit too!" Thanks for saving me money and time... and for making Mom happy!!! I commissioned Executive Accessories to fashion a shot “glass” from the wood of my friend’s cherry tree, which had to be felled after a long life. I described what I wanted and was very pleased with the results. The inlaid around the rim was a welcome suggestion from the owner of Executive Accessories. This ornament made a special object even more personal. I’ll remember the cherry tree now when I sip from this beautiful cup. You did a great job on the bowl and candle holder you made from that old cherry log I gave you. Whenever I use them memories of the day I cut down that cherry tree while clearing my property for a home site come to mind. As you know the log had many imperfections which makes me even more amazed at how you fashioned these pieces around the imperfections and even used them to add character. They also serve as excellent conversation pieces that give me the opportunity to explain what my property looked like before construction of my home. Again thanks for all the effort you put forth in making the pieces I am very proud of them. Buy the way I have more logs that I'm sure you could turn into many interesting works of art.